This article first appeared on East Niagara Post on June 9, 2015. It is repeated here as I work to put all my book reviews in one place. They will be posted on Thursdays or Fridays and only be altered from the original in that I will add publisher information and pages. Hopefully, by revisiting these reviews, other people might find a book they'd like to pick up for their own enjoyment. I’ve stated before that novels with rich, deep characters are my favorite books to read. Characters in these books evoke an emotional response, whether it be love, admiration, pity, or anger. This week’s review concerns a book that I found in the library that has a protagonist that makes you think the person is real. 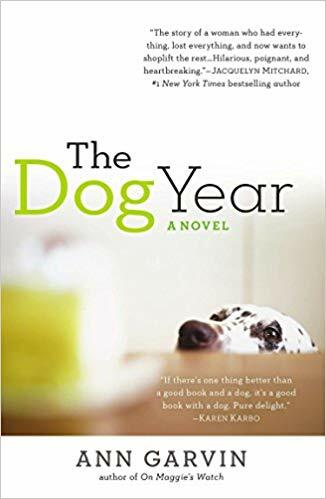 The Dog Year by Ann Garvin is one of those books. Dr. Lucy Peterman’s is lost in life after her husband is killed in an auto accident and she suffered a miscarriage during the same. A very successful plastic surgeon, Peterman suddenly finds herself avoiding interaction with anyone else, and inexplicably stealing from her job and her local stores. She doesn’t even realize she’s doing it until she’s caught by the supply nurse in the act of taking more supplies. The hospital gives her the choice of accepting criminal charges, thus losing her job, or to go through psychiatric counseling including an addict’s meeting. Of course she doesn’t see the problem or the fact that some of her friends have been covering for her since her husband’s death. While she avoids interaction with the others in her group, she finds solace in the company of a dog that she finds. It is Little Dog that finally helps break down the barriers between Peterman and those trying to help her. She finally relates to the group of people in the meetings with her, and despite her best efforts to keep an old friend at bay, she finds love again. Lucy Peterman has a problem with self-esteem, especially as the book starts. With her husband dead, she has no idea how any man could love her. She was lucky to have found a man before. As a widow who believes she is not attractive, she feels that she will never be a mother, let alone fall in love again. The relationships between Peterman and her group of addicts grows and becomes true friendship. It takes the whole book for her to come out of her post-accident funk. Garvin has built a character who slowly develops all the way through the narrative. Each new situation gives her a new set of obstacles she must overcome to move on. It’s the dog, and later dogs, that pull all the characters together into friendship. Sometimes you just have to find that one thing that pull two strangers into friendship. And just like in real life, even tragedy can pull people together. Ann Garvin’s writing, while it keeps the reader engaged, sometimes moves in erratic fashion. This mimics real life where sometimes time seems to fly by and other times it seems to drag. Garvin gets inside the mind of a person broken by the death of a spouse and the death of their unborn child. Garvin’s character questions her station in life and details the struggles someone in that position would go through. Every incident in her life is questioned as to how she would decide if the accident had never happened. I enjoyed this book quite a lot. Sometimes when you read a book the signs are there as to where the plot will ultimately end. Garvin gives us some hints to the conclusion of this book, but throws in obstacles to make the reader question everything he or she believed. In the end, Lucy Peterman is not totally healed, but she is healed enough to love herself and those around her, including her new friends. Craig Bacon doesn’t need a dog to find friends. He has four darn cute kids who can help with that.